The first time I tasted an apple raita was prepared by my Sister in law during one of our vacations. She had used red apples, it tasted so nice that I immediately noted down its recipe in my mind when she told me orally. Inspite of memorizing it and with a note to myself to try her recipe, I was not able to make this salad after our return for some or the other reason. After few days, the dish was out of my mind and forgotten completely. I was reminded of it once again when I came across a salad recipe in the book "The Konkani Saraswat Cuisine" using Green apples. I immediately bookmarked it and decided to try it. I got my grey cells working trying to remember the recipe that was given by my SIL. A healthy salad, enriched with sweetness and tangyness, you will love those crunchy bites mixed with raisin bites. Since then I have been preparing it but was unable to click any photos. Last week, HD bought some red and green apples and suggested me to prepare it as an accompaniment to the green peas pulao that I had planned. Immediately I agreed and clicked some photos too. 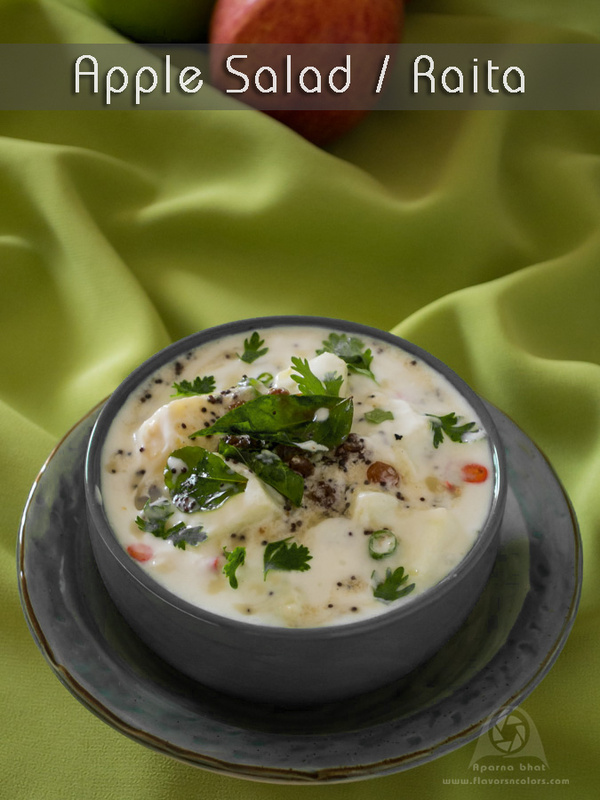 Below I have shared the recipe inspired by my SIL and from Asha aunty's book. Do try and leave your feedback. Whisk the yogurt with water in a bowl. Add drained raisins, crushed/ finely sliced chillies, finely chopped coriander leaves, salt to taste, sugar to taste. Mix well and keep it aside. Prepare the seasoning with ingredients mentioned above and pour it over the salad. Let it sit for 5 mins, stir well. Enjoy eating this refreshing salad as it is or serve it as an accompaniment to plain steamed rice, chappatis or variety rice. This looks and sounds delicious!! It looks like a creamy apple soup. YUM!! !